This is part two of a two-part series exploring the recently installed exhibit, “Women’s Words, Women’s Work.” The exhibit will be on display through December 2018 and explores the social and cultural expectations that have framed women’s experiences on the Oregon State campus over 150 years. The exhibit makes extensive use of SCARC’s manuscript, photograph and oral history collections. What were some of the issues you encountered in finding a variety of materials and women to represent? Rachel Lilley: We’re trying, as a University, to be more inclusive, but the evidence of exclusivity was a very challenging aspect of the creation of this exhibit. We tried not to “tokenize,” or represent 1940s-, 1960s-, 1990s-era OSU as a more diverse place than it was, while at the same time highlighting the women of color, the LGBTQ+ persons, who were agents of change on campus. The source material wasn’t always a big help in that regard, as these women had either not made it into the historical record at all, or weren’t identified in a way that allowed us to tell their stories. Tiah Edmunson-Morton: Well to put it plainly: there are a lot of white women in OSU’s history. So, finding women of color was a challenge, as was feeling like they were being included for reasons other than their race or ethnicity. That said, there were many times I was surprised to find so many women of color in science or to find reports from years ago showing that administrators, students, and faculty were struggling with diversity. Another challenge was finding quotes. We leaned heavily on the OSU Sesquicentennial Oral History project, both because it is a robust one with lots of interviews, but also because all the interviews were transcribed. One thing that Chris said when we were discussing themes for the class was that as project lead for the OSU 150 OH project he’d noticed how narrow the fields of representation of women were. I didn’t really know what he meant until I ended up with 15 quotes from 3 women and only a handful from others. I feel proud that we are so deliberately working to document more voices now! Finally, archivists always struggle to represent the “recent past” and this was no exception. I was glad we had oral histories that were relatively recent, but it was much easier to find historic material. Chris Petersen: Generally speaking, our photo collections tend to reflect the decades prior to the 1970s most heavily. As such, it can be difficult to find appropriate imagery that is more recent. Also, as with any exhibit, one needs to be careful about choosing originals that might make a more striking impact but can also be damaged by being placed on display. What surprised you about the materials you found while designing the exhibit? Or items you didn’t find? CP: I wasn’t really involved with this component of the work, so I don’t have much in the way of comment. I do know that Tiah and Rachel were often struck by the anonymity of many of the women depicted in our photo collections. Clearly these women were serving in many important roles, but often their identities were not recorded. I think this lack of documentation says a lot. TEM: I’m not sure what I was expecting to find… There were some pictures of women (c. 1920) doing car repairs as part of an auto mechanics lesson and another of a women’s football team. I’m pretty sure the mechanics were real but suspect that the football players might have been staged. 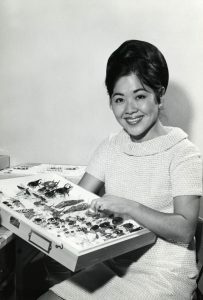 Personally I’m not a fan of bugs, but the photos of the female entomologists were phenomenal, as were all the pictures of women in labs. I was pretty bummed out when I found out Jeanne Dost’s papers were at the UO. She started the OSU Women’s Center and it seems the UO collection has some good material about that time. What were some of the things you learned in the course of curating the exhibit? CP: My understanding of the richness of our oral history collections, image collections, and digital collections was confirmed by working on this exhibit. The skill and versatility of the colleagues with whom I worked on the project was also clearly evident throughout the process. TEM: I was always excited when I found out more about the roles women played in Home Economics – or really anything about the program. It’s interesting to learn more about how rigorous the program was, as well as how much “hard science” went into their research. RL: I learned that creating an exhibit of this magnitude is a full time job. 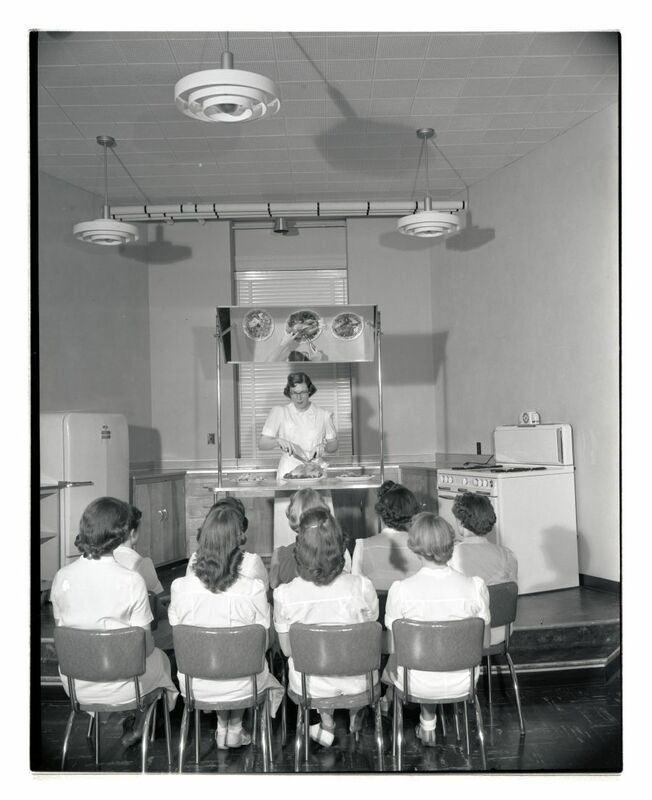 How has the exhibit shifted your perspective on the role of women on OSU’s campus and in academia more broadly? CP: For me, the exhibit, and the class before it, really underscored the importance of Title IX in bringing about change. Typically people talk about Title IX in the context of sports, and it was certainly crucial in ushering in an entirely new era for women in that regard. But women also started to make in-roads in other academic areas at around this time as well, and that’s no accident. 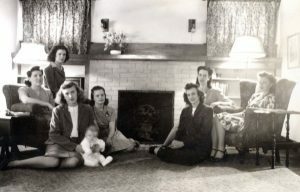 For me, Title IX is the single most important reason why women at Oregon State began to study in areas like Forestry and Engineering; spaces that had traditionally been mostly or totally dominated by men. The relative gender parity that we see across colleges today has evolved out of that historical moment. One thing that struck me when I was looking for quotes was how these women just … kept … pushing! So while that was inspirational, most of the stories they told were really hard to read. A bright spot exception was when they would talk about the role of their own mentors or other women who had inspired them. That was when the language felt more optimistic. What do you see as the largest the success of the exhibit? The largest challenge? Why? CP: The largest success of the exhibit is that it is done and that it tells an important story, one that has been a bit overlooked in the past. 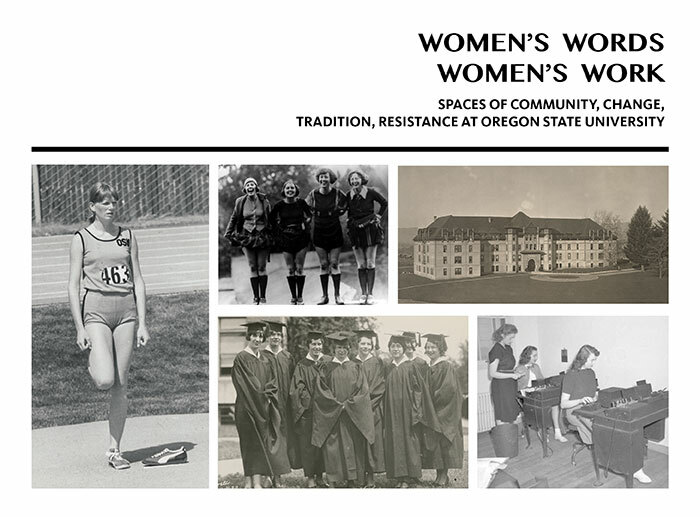 I think the exhibit will also serve as a nexus or platform for additional programming that is likely to spread awareness even further, both about women’s history at OSU and about SCARC in general. The biggest challenge of the exhibit was trying to distill a huge topic into manageable components that could be absorbed by a visitor to our foyer. This is a challenge with any exhibit, but was especially so for a topic as weighty as this one. TEM: I love how many people the exhibit brought together even before it was an actual physical thing to see! People were really excited and engaged, which is something that inspires you to keep working even when you hit the exhibit design/install wall. The biggest challenge was confronting how much I wanted to see massive changes between 1918 and 2018… And while there certainly have been big societal shifts in the last 100 / 150 years, I was also struck by how little things have changed. I’ve been an archivist for a long time, so you think I’d be used to that by now! What is your favorite aspect of curating the exhibit? Do you have a favorite item? Or an item you wish you could have included but didn’t? RL: I loved getting to partner with staff members that I don’t work with on a day-to-day basis. It’s awesome to see the talents and abilities of your co-workers on display in a project like this. I think my favorite item is the Hayden Bridge Unit scrapbook from the Extension Service Records. Probably my favorite thing is actually not an archival item – it’s the wallpaper with the quotes and pictures. We’d never printed a full sheet before, and even when we had wallpaper it didn’t have the lovely large pictures and words. Every time I walk into the gallery I love it all over again! This entry was posted in Main Page on July 25, 2018 by dvoraka.